Teaching literacy and math at once helps make the most of class time while deepening young students’ understanding in both subjects. When I was an elementary classroom teacher, I always welcomed activities that could serve dual duty—combining the goals of two subjects at once, in a seamless whole. Such activities streamlined my work efforts (so important for busy teachers), and they used valuable classroom time to the fullest. With the current strong emphasis on literacy and math, it makes great sense to combine these two subjects. 1. Use stories to develop number line skills: One of the biggest contributors to math achievement, even into adulthood, is a strong grasp of the number line. While we might be tempted to think the number line is just about counting, it’s also about sequence and spatial relationship. Students who have a firm mental number line are far more able to manipulate numbers and have a better sense of when they’re moving in the right direction in solving math problems. Sequence is built into our experience with books, partly because language itself is necessarily sequential. But, beyond the simple act of reading and having children read, teachers can purposely use stories with strong sequences to strengthen number line skills. Let’s take, for instance, the largely wordless picture book Tuesday, by David Weisner, in which frogs take flight on lily pads from a deserted-looking bog, and then proceed to make a surreal trip through a residential neighborhood (even stopping to watch an old woman’s TV while she sleeps in front of it). 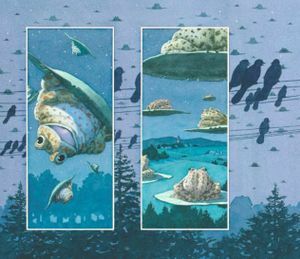 Images in books like David Weisner’s “Tuesday,” seen here, can be used to explore concepts in math. With just a little questioning, the teacher can turn the reading of Tuesday into a sequencing activity that uses the language of the number line (before, after, forward, backward, next, then). Or the teacher can use a hands-on “story train” sequencing approach like the one I’ve included in my early reader Molly and Joe Want to Know (which includes story cards, the main events of the story in pictorial form—children re-enact the text by putting the cards in order, like linking rail cars in a train). Story trains can also use the language of the number line while providing the chance to manipulate spatial relationships along a single line. What do you think happened before the frogs took flight? What do you think happened after the old woman woke up? What funny thing happened when the frogs moved forward through the clothesline? Why do you think they didn’t go backward at that point instead? Strengthening spatial relationship sense: Story train sequencing necessarily creates spatial relationships that allow children to literally see how far the events of a story or poem are from each other. The children can also be asked to count up the events once the train is complete, pointing to each card as they count. For children who already recognize at a glance that there are still three apples, you can turn this into a fraction conversation. “Oh, look, one-third of the apples are on the left side. Where are the other two-thirds hiding?” Such a conversation won’t necessarily be simple—fractions are famously difficult even for adults—but this is a chance to speak the language and do the math together. 3. Using make-your-own books to solidify counting skills: It’s hard to believe that counting is a skill so predictive of math achievement even into adulthood, but it’s true: Those who count strong early on often have a lifelong math advantage. 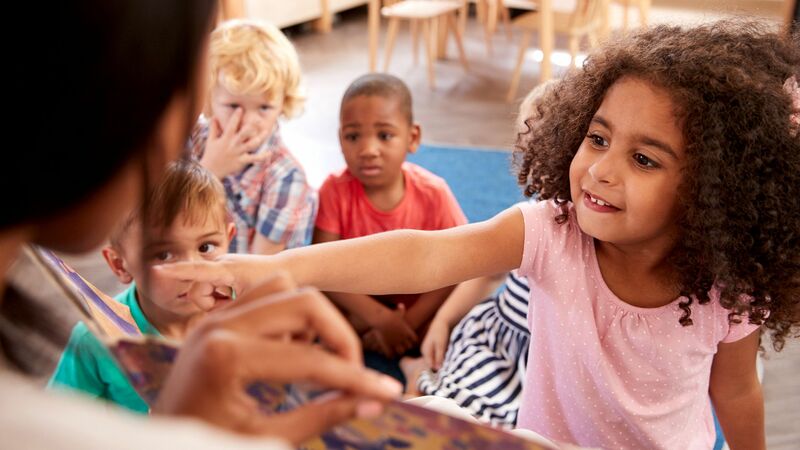 Such books—which children can color, write in, and eventually read aloud to friends and family—can also include important counting terms such as whole and altogether that relate naturally to the skill of addition. If your classroom is a busy place, I encourage you to take advantage of crossover approaches that teach both literacy and math skills at once. You’ll reduce your workload, and your children can enjoy the richness of dual-duty activities.